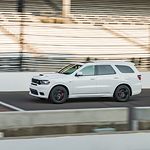 The all-new Dodge Durango starts at $29,995. But if you choose not to buy and prefer to lease, then expect to pay about $339 per month. If you live in King George, you will get the best price at Leckner Chrysler Dodge Jeep Ram! The vehicle will stop the trailing traffic with the signature LED rear tailights with a beautiful bright glow. Let's swing around to the front of the vehicle and check out the automatic high beams that can brighten the way far beyond what the naked eye can see. Finish the job with the split-crosshair grille that has a rugged Dodge feel.